- LIBAN – Tyr - Five Byzantine tombs were discovered in the southern city of Tyre, as well as parts of the old Byzantine route that had connected the ancient island of Tyr with mainland. The tombs were made of marble, came in different sizes and carried Byzantine inscriptions on them. The tombs, which are said to go back to the 14th century, were in an area not too far from the ancient Greek Palaestra, “Wrestling School”; that encouraged tourists from various countries of the world to come and check it out themselves. The city of Tyr, which was first established by the Phoenicians and was a major global trade center for many centuries, remains to be one of Lebanon's top touristic sites and is known as the city which was born from the sea. The city of Tyre was a site for settlement to many civilizations such as the Pheonician, the Roman, and the Byzantine. This enriched it with valuable historical ruins which go back to over 5000 years. - ROYAUME UNI – – Nonsuch - A model of a Surrey palace built by Henry VIII and that once symbolised the power and the grandeur of the Tudor dynasty is to be unveiled. Nonsuch Palace in Cheam was constructed to rival those of the French King, Francis I. It was demolished by a mistress of King Charles II in the late 17th century. Work started on Nonsuch Palace in 1538, six months after Jane Seymour gave birth to Henry VIII's son, later to be Edward VI. Prof Biddle said: "From the start it was Henry's evident intention to celebrate the birth of long awaited male heir by building a house without equal." 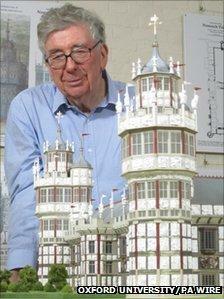 "With the plan established, it is possible to attempt to accurately evaluate what the house looked like in its heyday. "It had a decorative scheme which was more than 900 feet long, with a minimum average height of 24 feet, covering a surface of 21,600 square feet." - FRANCE - La Voulte-sur-Rhône - D’importantes fouilles vont se dérouler sur les hauteurs de La Voulte-sur-Rhône durant le premier trimestre 2012. Un diagnostic vient en effet d’être réalisé sur un terrain de 3 hectares sur lequel sera bientôt construit un éco-lotissement. Et les conclusions ont été rendues publiques par l’INRAP (Institut national de recherches archéologiques préventives) : les murs d’une villa romaine datant du 4 e ou 5 e siècle ont été découverts dans le sol ainsi que deux pièces en bronze et diverses poteries et objets en céramique. Une cahute moyenâgeuse a également été trouvée. - TURQUIE – - Turkey is demanding the return of an ancient marble head, now languishing in the stores of a London museum, which was taken from Anatolia more than a century ago. The Turkish culture ministry has asked the Victoria and Albert Museum to return a 1,700-year-old life-sized marble carving of a child's head, described as bearing a likeness to Eros, the Greek god of love. In 1882, the archaeologist Sir Charles Wilson, then Britain's consul-general in Anatolia, removed the head from the Sidamara Sarcophagus, a huge tomb dating from the third century, which he had excavated. The sarcophagus, which now sits in Istanbul's Museum of Archaeology, is one of the finest and most widely known of its type and period. Sir Charles, who served in the Royal Engineers, conducted archaeological surveys in Palestine and Lebanon before moving to Anatolia, which corresponds to most of present-day Turkey, in 1879. 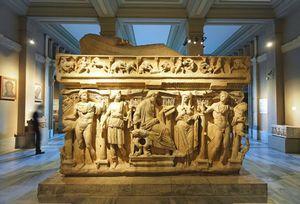 He removed the head from the Sidamara Sarcophagus, which he then re-covered in the hope of acquiring the whole object. The head is that of a child with curly hair looking over his shoulder. Sir Charles's family later donated the head to the V&A, where it is held in the museum's stores. - CHINE – Xuyi - A Dayunshan Han Dynasty (206 BC-220 AD) tomb in Xuyi county is a great discovery for Jiangsu province. The host of the tomb is Liu Fei, the elder brother of Emperor Hanwu and the first King of Jiangdu. Two dishes, inscribed with the Chinese characters "Naoshi", were found by the Archaeology Institute of Nanjing Museum and the Dayunshan Han Dynasty tomb archaeology team. The dishes are the first unearthed remains which are not directly relevant to the King of Jiangdu, Liu Fei. According to archaeologists' analysis, "Naoshi" dishes are consistent with the historical "Naoshi", the succubus mistress of Liu Fei. Li Zebin, deputy director of archaeology Institute of Nanjing Museum and leader of the Dayunshan Han Dynasty tomb archaeology team, said the unearthed dishes vividly present a succubus mistress of "King of Jiangdu" and play an important part in the research of scenes from 2,000 years ago. - ROYAUME UNI – Manchester - Parts of Manchester’s Whitworth Park will be excavated by University staff and students. Archaeologist Dr Melanie Giles from The University of Manchester said “Whitworth was one of industrial Manchester’s most loved Victorian and Edwardian Parks. “It was a colourful place, filled with elaborate flowerbeds and walkways, to promote the health and wellbeing of adults and children from all social classes around Oxford Road, Rusholme and Moss Side. “We hope to find remains of these structures and objects that were lost or left behind during days out, picnics and play-times.” Whitworth Park opened in 1890, and was soon a popular place to take the air and to be seen promenading, becoming an important part of people’s lives and identities. - USA – Portland - Archaeologists believe they have unearthed a historic cycle track on Portland. Mystery surrounds the origins of the site on New Ground. The society is now calling on residents to help unravel the mystery and piece together the story surrounding the track. It is believed the velodrome could have been of a world class standard when constructed but the identity of the people who built it remains uncertain. Members of ISAS believe the track pre-dates the First World War and may have been used by military personnel based at the Verne before it became a prison. The keen amateur archaeologist said: “It’s really interesting because it’s something I’ve never heard mentioned and I’ve lived on the island all my life. Nobody has ever mentioned it being there and so to have it suddenly turn-up and to produce something that was probably a world class facility at the time was amazing. “We believe it’s a cycle track because it’s a 400 yard oval track with a slope on it. “So as far as we can tell it’s pre-First World War so chances are it’s 1880 to 1890.